The Summer Camp Program at the Chatham Club runs from mid June through late August. 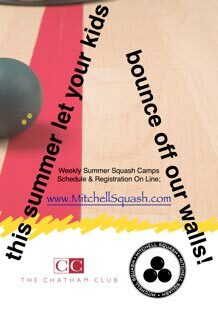 Our weekly summer squash camps provide young players the opportunity to improve their squash games, train hard, make new friends and have a week of fun on and off the court. Our camps are run by top squash instructors who have a passion for teaching and motivating our young players to be the best they can. Our camps while focussing on squash will also offer our young athletes time to experience badminton, ping pong, soccer, and other fun activities-camp days will be filled with exciting activities. Special weeks of camps are offered for total beginners and other weeks for elite tournament players. This summer we will offer several special tournament preparation weeks followed by professional coaching at a weekend US Squash sanctioned tournament. These camps will focus on preparing and training our young athletes for an appropriate level sanctioned tournament where the athletes will receive professional coaching throughout the event. Each camp will provide an environment where players of all ages and skill levels can improve their level of play. We guarantee each participant will leave camp with a personal training program of drills and exercises that will, even after camp, help catapult their game to new levels. Learning how to continuously reach new plateaus and enjoying the process is an important part of summer camp. We offer an exciting positive setting for hard work while making the focused learning and practice enjoyable. We provide the perfect environment for learning, fun and improvement. Tournament days (Fridays) are an integral part of summer camp. 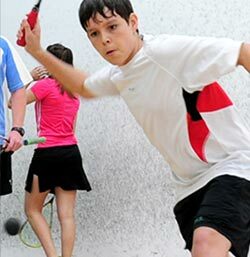 The objective is to watch the junior athletes and determine how they react in competitive tournament matches. For these weeks students receive a reduced rate (members rate) for the camp. Receive 5% off for multiple weeks or siblings. 1st week, or sibling regular price. Additional weeks or sibling are eligible for a single 5% deduction. To be eligible for multiple camp savings program all camps must be paid in full prior to the first day of the camps. Receive $100 off your tuition by hosting an out of state camper. Savings from all programs may be combined up to a maximum camp discount of 20%. 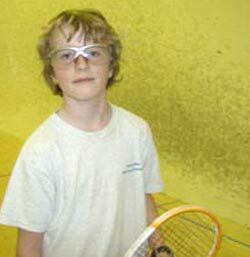 To be eligible referrals must be completely new to the squash program.